If you wake up feeling like your skin is a little dull after a night of tossing and turning, you’re absolutely right in thinking you didn’t get enough beauty sleep. Our dermatologist Dr Katherine Armour explains why. "Sleep loss causes the body to release too little human growth hormone, which promotes the repair of skin cells. When we are asleep, our cells rebuild and repair themselves, so if you don't sleep well or sleep long enough, this function may be impaired. “Lack of sleep can also cause our body to become stressed, and as a result our blood vessels may tighten up, affecting the flow of nutrients to the skin and scalp, causing the skin and hair to look dull. "Plus lack of sleep can lead to your body releasing increased levels of cortisol, which is known to break down collagen—the protein that keeps skin firm, plump, and wrinkle free” said Dr Katherine Armour. And there’s even a study that suggests that poor sleepers show increased signs of skin ageing. Researchers found that those who didn't sleep well exhibited more signs of skin ageing including fine lines, uneven pigmentation and reduced skin elasticity. The researchers also found that those who enjoyed quality sleep were more quick to recover from stressors to the skin, such as the sun and environmental toxins. 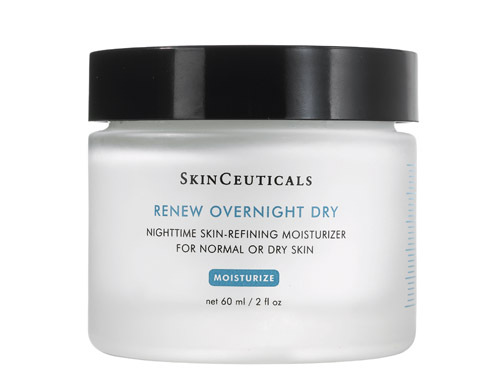 Rich night creams or active serums containing ingredients designed to repair the skin are particularly effective when applied to clean skin before bed. This allows them to do their work without interference from further damaging effects such as the sun, pollution or makeup products. This rich night cream is specifically designed for dry skin. It contains 10% hydroxyl acids. In this concentration hyroxyl acids can encourage collagen production and stimulate glycosaminoglycans, a group of substances that help with the maintenance and support of collagen and elastin and the retention of water, which helps to keep our skin supple. It may also help to even out pigmentation and reverse some signs of sun damage by encouraging the shedding of old skin cells. Retinol is another name for Vitamin A. Vitamin A is an amazing repair ingredient that enhances skin tone by increasing collagen and elastin production, texture, and diminishes the appearance of fine lines and coarse wrinkles. It also treats pigmentation, broken blood vessels, and congestion. Age defense comes in 3 different strengths, for first time users there is the 0.25 while those experienced with active skincare can step up to the 0.5 or 1.0. Want to know more about your skin type? Visit the clinic for a complimentary skin care consultation with our skin expert Alani Fowler who can assess your skin type, age and skin needs.